The lottery game lotto has several versions worldwide. The Italian SuperEnalotto is one the most popular ones. This lottery was established in the 1950s. Since then it has given great cash prizes to thousands of Italian people. Some of them even became millionaires! 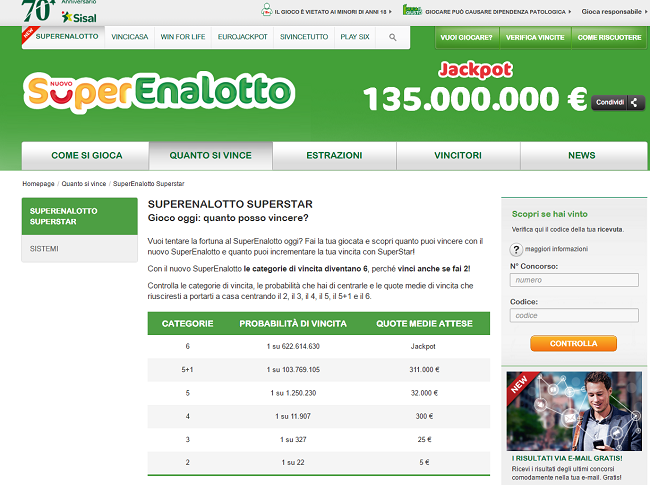 One of the reasons for the popularity of SuperEnalotto is that the Jackpot doesn’t have a maximum. If there’s no hit, the amount of money you can win with the Jackpot continues to grow. The Jackpot of SuperEnalotto in Italy can be incredibly high. A Jackpot hit is a big dream for many Italian Lotto players. Sometimes you can even win more than € 100 million. However, it’s not very common that the Jackpot doesn’t have a maximum. Lotteries in other countries do use a limit. The high Jackpot explains why people from all over the world participate in the SuperEnalotto. You don’t have to be Italian to play this lottery game. You can simply become a member of the lottery online. This is why, among others, the Spanish and Dutch people love to try their luck in the SuperEnalotto. This lottery has become way more efficient the last couple of years. For example, before 2009 all the draws took place in different Italian cities. Nowadays it’s just one location at the same time every week. There’s not a very high chance of winning the Jackpot. However, when it does happen all of Europe is impressed. For example, in 2009 a person won about € 147, 8 million. The highest Jackpot hit ever, with an astonishing amount of € 177,8 million, took place in 2010. It’s actually quite simple to buy a ticket for the SuperEnalotto. The only thing you have to do is visit the website of the lottery. Decide how many tickets you want to buy and make clear the preferred number of draws. You can simply purchase the tickets online with payment methods like iDeal. One of the advantages of the internet is that the Lotto prize you’ve won is also transferred immediately. You’ll even get a notification after winning. So thanks to the internet you don’t have to wait to enjoy your prize. Playing in the SuperEnalotto only costs € 1,00. You have to choose six numbers or a multiple number combination immediately. Of course multiple number combinations are only possible with several lottery tickets. For each ticket you have to pay € 1,00. Do you also like to have a SuperStar number? This bonus number costs € 0,50 euro. So with a lottery ticket of € 1,50 you’ll have a chance of becoming a millionaire in Italy. It’s definitely worth trying! The SuperEnalotto works just as simple as the buying process. As a player, you need to predict as much numbers correctly as possible. This makes it a very exciting Lotto game. You can choose between six numbers in total, from a 1-90 series. Perhaps there’s a lucky number you always use. Some people also use their date of birth. The computer will help you when it’s really too difficult to pick a number. In that case, you’ll get a combination of six random numbers. It’s important to take a look at the so called ‘hot’ and ‘cold’ numbers. It means that some numbers are drawn more than others. For example, in the SuperEnalotto the numbers 55, 82, 1, 88, 90 and 85 were very ‘hot’ in the past two years. However, you had less chance of winning with the numbers 50, 18, 30, 28, 9, 59 and 60. Take a look at the website for the current ‘hot’ and ‘cold’ numbers. Good luck! All the Lotto numbers are drawn from a special machine. Players also need to choose the so-called ‘Super Star’. This is a bonus number that emerges from another machine. However, it only valuable when the other five balls have the right number. Is this the case? Then it’s definitely time for a party, because you’ve won a big prize! Besides the Jackpot there are some other nice prizes as well. The SuperEnalotto has six categories in total. The first prize is the Jackpot and the sixth prize has the lowest amount of money you can win. To win the Jackpot you need to have all the six numbers correctly. If you have one less, you’ll win the second or third prize. This depends on whether you use the SuperStar number. Of course this bonus number also needs to be correct. You’ll win the sixth prize if you have two correct numbers. You have multiple chances of winning in the SuperEnalotto, because the lottery draws take place three times a week. Every Tuesday, Thursday and Saturday there’s excitement in the air. All the lottery draws are broadcasted live on the Italian television. You could also read the results on the website of SuperEnalotto. Nowadays it’s even possible to use free apps to see the results immediately. This makes it even more easy to play in the lottery. Just download the app when you don’t have time to watch the results on television. The SuperEnalotto has three draws per week, which take place on Tuesday, Thursday and Saturday. Normally lotteries as Euromillions or Eurojackpot have 1 or 2 draws in a week. All prize draws are broadcast live on the Italian television. Of course the results were also to read on the internet. The lottery website also provides free apps to help you easily on your phone can view the results. When you play online with the SuperEnalotto you get also automatically when you have a message price have won. The average chance of winning in the SuperEnalotto is 1:20. The chance of winning increases when you buy more lottery tickets. This makes sense, because it gives you several number combinations. The winning chance also differs in the six prize categories of the lottery. For example, the chance on winning the Jackpot is 1:622.614.630 and 1:103.769.105 for the second prize. This is quite a difference with the lowest category actually, which has a winning chance of 1:22. So the chances of winning a big prize aren’t very high. However, you never know if it’s going to be your lucky day!